• Schedule time - you have to dedicate time to declutter. I find that 45 minutes is a great chunk of time to get any job done. If the job is overwhelming, I just work at it for 45 minutes, then I go back to it some other time. What I do is, I set my cell phone's alarm clock to countdown for 45 minutes and I start to work. I recently organized my closet that way. There were a few bags of trash, the donation bags went straight to my car and the storage bags went to the correct place too. When those 45 minutes were over, I still had 15 minutes to do whatever I wanted to do. During that time I can snack if I'm hungry, look at social media or simply rest. • Work faithfully - it's important to stay focused on the task during those 45-minutes. I say that because on my way to my 45-minute job I can find a million other things to do. Being faithful to that one big project is the key to getting rid of clutter for good. My one big project was my closet. You could not walk in the place at all (and yes, some of my friends saw it too). On my way there I had to talk myself out of finding other projects such as going to the store and buying more organization supplies, making sure I clean other rooms... you get the point. Be clear with your goal and work at it faithfully for 45 minutes. • Repeat - What? Is this not a magic solution? And the answer is no. Simply because your family lives in your home. That room you proudly cleaned will get messy again but hopefully not to the same degree. It is important to put this 45-minute practice on repeat so that things stay organized. 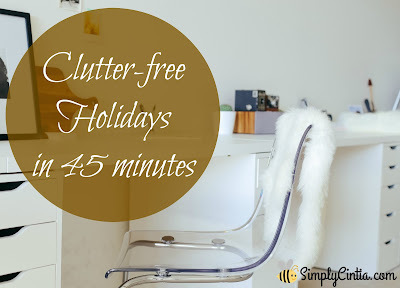 I might not have a big closet mess to dive into, but I have other small cluttered spaces that could use the same 45-minute decluttering strategy. I also did not finish my laundry yesterday, so believe me, I'm setting my clock for 45-minutes today and I am putting clothes away only to repeat this process next laundry day. The key is to find a strategy that works for you and repeat it when needed. • Have a list of pre-holiday projects - What are the areas in your life that need attention before the holidays? Is it your Christmas decor spot? Is it kids' toys? Make a list of pre-holiday projects so that your life will be easier when it's time to be officially merry and bright. My closet was the big monster project but kids' toys is next on the list. We don't have an overwhelming amount of things (I've been donating things throughout the year) but the toys can use some organization. I also plan on looking intently in my kitchen to be sure we don't buy things we already have for our holiday dinners. We can all have a list of pre-holiday projects. Being organized will save us time and it will make us more efficient as we move towards the most wonderful time of the year. How do you see yourself the day after a big holiday such as Christmas? I see myself as a peaceful wife and mother who will not dread the holidays but will actually enjoy it with my family. Being organized ahead of time will help me accomplish that goal. I challenge you to schedule time to declutter and focus on getting organized (not overwhelmed) as we approach this holiday season. Have a productive day my friends!